Many authors get story inspiration from their own lives, myself included. But how about when something you’ve written in a book comes true in your life? Two years ago, when I joined the Arcadia Valley Romance project, I started my contribution with a novella called Sheltered Hearts. 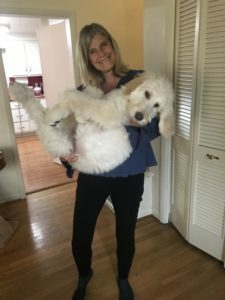 It introduced former major league baseball player Alex Quintana, recently dumped Patricia Aiken, a warmhearted Mexican restaurant named El Corazon, a snowstorm… and a goldendoodle, Bear. Patricia had rescued the dog from her not-so-nice ex, and he became a mischievous, joyful presence throughout the novella. You can download it for free! At the time, I was the proud owner of a senior Maltese mix, and it didn’t occur to me that my life as a dog owner would ever change. But Porter developed health problems and crossed the rainbow bridge back in March of this year… in fact, I blogged about it here. I grieved, and walked dogs at the local animal shelter, and tried to decide whether to get another pet. One day the answer came to me. Inspired by Bear, my daughter and I brought home a goldendoodle puppy in August. And he grew, and grew, and grew…. in fact, he’s STILL growing! Now, I’m getting inspired by Nash… look for lots of naughty puppies in my upcoming books. You can read about Bear, the inspiration for Nash, in the free collection that kicks off the Arcadia Valley Romance series. And if you want to follow Nash’s antics, he has his own Instagram account! 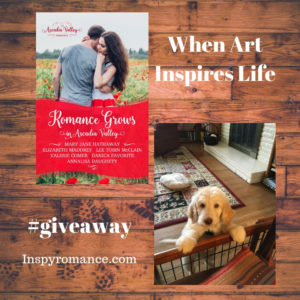 Sign up for my newsletter if you’d like a free romance novella featuring, you guessed it, DOGS! Hi Lee, cute puppy and great photos of you and your daughter with Nash. We no longer have a dog- it would not be fair with all of us away during the day and a puppy home alone. I miss the puppy antics, but I enjoy not having to barricade the garden to keep digging dogs out!! Hehe, I have just finished reading John Grisham’s Theodore Boone series with my boys- those books have some hilarious animal/pet moments in them. I think horses and dogs work well in books- they seem to be the most common. I’ll have to look into the John Grisham books–thank you! We definitely have a lot of barricades up in our house to prevent puppy destruction. Hi Lee! I agree with Wemble I enjoy seeing pictures of you and your daughter with Nash. Our last furry baby, 16 year old deaf Sheltie Penny, crossed the rainbow August 26, 2018. As retirees, no more fur babies, since we want to travel and with our health, while we enjoy puppies it wouldn’t be far to leave a fur baby behind. I enjoy reading about animals – all kinds of animals, but especially unusual ones: parrots, tortoise, goat, pigeons, rooster – to mention a few. I chuckle thinking about Valerie Comer’s goat Pansy or pigeons in Aubrey Wynne’s Chicago Christmas romance Paper Love. While dogs seem to be the most common, unusual animals in stories or movies are more memorable, especially if they pull off some unusual feat in the story. Best wishes. YES to Valerie’s goat! So much fun. Another inspirational romance with a funny goat is Laurel Blount’s latest, A Baby for the Minister. Thanks for commenting. Thanks for the shoutout for Pansy, and Lee, I’d missed that Laurel had a new book out. I enjoyed her first one, so I’ll hunt it up! Great photos and congratulations on Nash! I LOVE dogs…but have none now. I had a Maltese for 15 years and a shihtzu for 14, both of whom I adored! Arcadia Valley is one if my favorite series, you all did an awesome job!! Thank you, Paula… Arcadia Valley was so much fun. I love the little dogs, too. Our Maltese mix was the dog of my heart. I like a certain fictional black and white border collie called Domino featuring rather prominently in Raspberries and Vinegar, thet pops up in all the Farm Fresh Romances. Border collies are such wonderful farm dogs–perfect for Valerie’s series! I hear you… dogs are expensive and time-consuming… and mess-producing. But worth it! I liked the goat in Valerie Comers book. It reminded me of my brothers goats who were always getting in trouble. I like unusual animals like rabbits or gerbils in books. Since I’m severely allergic to cats and dogs, those are animals we’ve had over the years. There were some really talented rabbits, gerbils and guinea pigs. We had a small guinea pig who was friends with a large rabbit. It was a riot when the little guinea pig tried to keep up with the rabbit. Sounds fun… I didn’t know guinea pigs and rabbits could get along, let alone be friends! I enjoy stories that include a pet. Dogs, goats, horses, cats, and other pets add spice to life. They also bring love and laughter into the lives of their owners! While I grew up with chihuahuas, my children found a stray kitten many years ago. Our daughter convinced my husband we should keep this kitten as a pet. Patches lived a good 15 years. She loved sitting at a window and watching what went on outside. When children grew up and went to college, I was thankful for my furry friend, who would curl up with me as I would read. 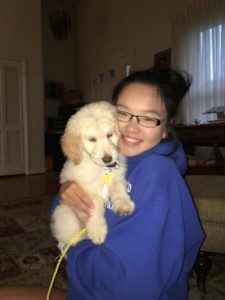 My daughter goes off to college next year… some of my friends think I’m crazy for getting a dog at this point, but I’m with you: a furry friend will keep me company when she’s away. I’m not sure I remember any specific animals in fiction, I am sure that there are plenty. It’s always nice for a single guy or a girl to have a cat or dog to come home to😀. My husband and I have an elderly cat, and would love to get a dog when she passes on, But I know that dogs do require much more care, so we will have to see! Hi Patty, my neighbor would occasionally watch other people’s dogs. She said it reminded her why she DIDN’T want to get a dog… all that work! I love reading about mischievous dogs in books or watch their antics on screen. I’m really life I prefer low maintenance pets, so all we own is a beta fish. Ha ha… I remember when my daughter was little, we tried to interest her in fishies as pets… turned around in the pet store, and she’d run over to the kittens and puppies. Hard to play with a fish, I guess! Sometimes we love the more difficult ones the best, right? Dogs, cats, or kids! I prefer small dogs, under 20 lbs. I’ve had them as pets for most of my life. What I’ve found personally, is mutes are the best, mixed breed are next, & pure breeds last. I’m talking health & care, not personality. I’ve 3 had pure bred dogs, but boy were they high maintenance! I’m a cat lover, so always enjoy when they show up in books. On the other end of the spectrum, I’ve enjoyed the various moose who are in Jan Elder’s books. If I had a favorite animal, it would be a cat. Unfortunately, due to severe allergies and asthma, I can’t have one. What a cute, huge, awesome dog, Lee. I love books with pets. Oh – my oldest isn’t a pet person, but my youngest daughter loves all animals so much. But recently, we are taking on the responsibility of caring for a little Pomeranian dog, and she’s the first dog my 7 yr old has ever taken a shine to. She’s very small and fluffy. I like Barnabas, a dog and Violet the cat in the Mitford books by Jan Karon. Barnabas is such a good companion to Father Tim and Violet is such a stereotypical cat. When I was younger, I also loved the High Hurdles series by Lauraine Snelling in which horses played a prominent role. As long as the interaction between the people and animals is pretty realistic, I enjoy reading about almost any kind of animal. Dogs are rather my favorites…they’re so conversational, so they become their own character in a book or movie. I love seeing dogs in Hallmark movies (which are my current holiday obsession) and love that they often use adoptable rescues in their work. I just want to say that I love your books. The ones that I have read are inspirational. Thank you, very much. Your doggy is so pretty. I’m glad you are having fun! I’m an “equal opportunity” critter lover…. Majority of movies have dogs ..
Pongo and Perdy … and all of their pups in 101 Dalmatians…. Lady, Tramp, Scottie, Jock …..
All Dogs Go to Heaven …..
can’t forget Babe the pig and Wilbur the pig with Charlotte, though…. The first time I read about animals in a book was when my grandma gave me a reader’s digest book, the title was something along the lines of Animals Can be Almost Human. There were some beautiful stories in that book. I can’t really remember stories about animals in novels at the moment. The Dog we had as kids and my brothers dog now both seem/ed to be a German Shepherd beagle mix, among other things, and were/are beautiful creatures! I would love to win the kindle fire as my kindle app on my samsung tablet hardly ever works and I NEED TO READ. Love the Arcadia Valley series! Also enjoyed all of the Sacred Bond books. Nash is such a cutie! Honestly, I’m not sure I can really answer your question. I’ve read books with dogs that cause mischief and “mayhem” resulting in two people getting together, but I’ve also seen the same with cats annd with horses and with llamas (or were those alpacas?) and sheep and…well this list could go on and on. Basically, I don’t have a favorite because I just really like how they’re used in the stories. Horses! I love books and movies with horses in them! The Thoroughbred series by Joanna Campbell was my first real love in books. I grew up wanting to move to Kentucky and raise and train and race Thoroughbred horses. Of course that dream never came true but I still love horses to this day!